We received this beautifully crafted walk-A-long-Snail from Hape. 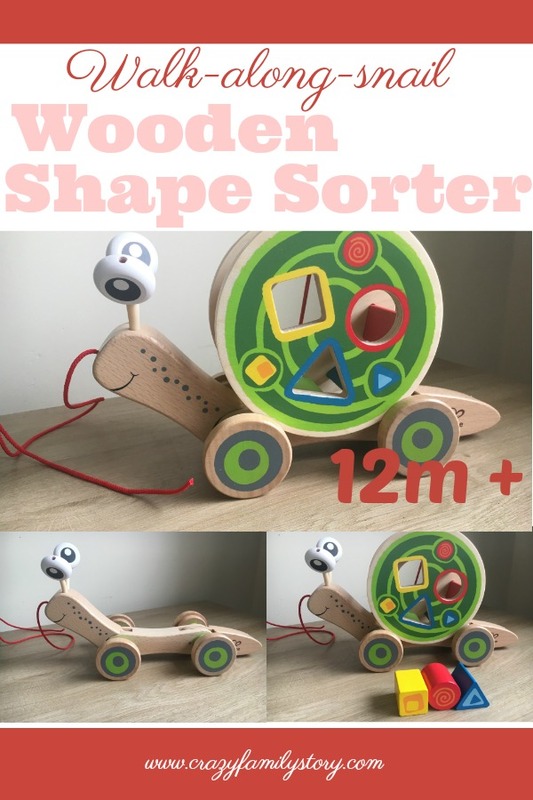 It is a baby wooden pull along toy, It also has a shell full of fun meaning its shell is cleverly crafted into a shape sorter. The Snail is bright and colourful, and comes with a square, triangle and circle that can be pushed into the right shapes on one side of the shell, then your child can use the other side of the shell to take them out and start all over again. Jack loved this toy, as soon as I removed the packaging from arond the box that the snail had been delivered in Jack was jumping up and down on the spot drawn to the snails bright colours, he was examining every part of the toy, the first thing he did was took it for a walk around the living room - he said "look mummy he has wibbly wobbly eyes" the eyes on the snail wobble as its being pulled along the tail also moves. 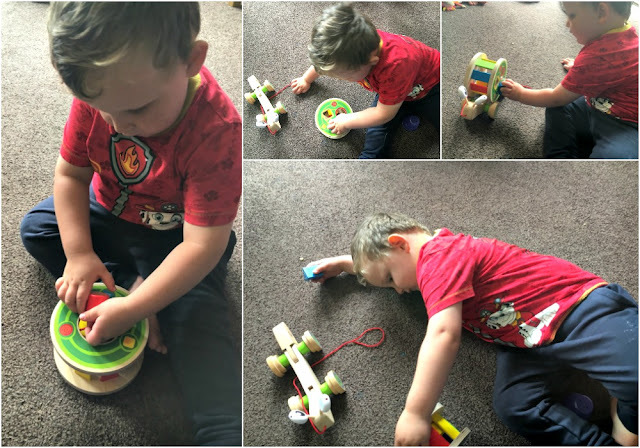 The next thing he did was sat on the floor with it to work out how the shape sorter works, Jack is two and could easily work out where each shape went but played with it over and over again. He was also interested in trying to guess what colour each shape was. Jack has played with this snail a lot since we received it which is a good indicator that it keeps children engaged, he really loves that you can take him for a walk and he likes that you can fill his shell with different things not just the shapes he came with. Overall we love the Walk-A-long-Snail it is a quality made children's wooden toy which is great if you have children that are rough or heavy handed, this would make a great toy for any child's Christmas list this year and is reasonably priced at £24.99 available to buy now from any Argos store. This fun walk-A-long-snail was sent to me for the purpose of this review all opinions expressed are honest and my own.